The Enforcement Directorate (ED) on Saturday grilled Chanda Kochhar, former managing director and chief executive officer of ICICI Bank, in connection with loans extended to many corporates, including Videocon group firms, while she was at the helm of the private lender. The probe agency also questioned her husband Deepak Kochhar along with some relatives and Videocon Industries Chairman Venugopal Dhoot in an alleged money-laundering case at its regional office in Mumbai. Today was the second consecutive day of questioning by the agency. They were questioned on Friday, too, following a search operation at the residences and business premises linked to the Kochhars and Dhoot in Mumbai and Aurangabad. The ED team had left at 8.30 pm on Friday and called them again on Saturday morning. 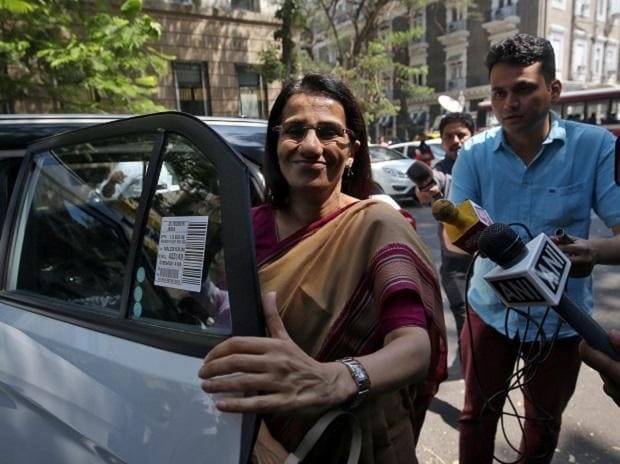 Chanda Kochhar reached the ED’s Mumbai office around 9 am and left in 40 minutes. The questioning of Deepak Kochhar and Dhoot, however, went on for 6-7 hours. Sources said that in 40-45 minutes, the former ICICI Bank MD was questioned on the details which agency is already in possession with. She has been asked to come with certain more documents to the agency’s office in New Delhi, they added. Deepak Kochhar was questioned on his deals with Dhoot’s firms and his alleged connection with Marutitius-based companies. The ED also wanted to know the rationale behind Firstland Holdings and DH Renewables Holding's investment (Rs 325 crore and Rs 67 crore, respectively) in NuPower though compulsory convertible preference shares in tranches. “If required, we will take reference from the Srikrishna panel report and inputs from other agencies probing the matter,” said an official in know. The ED is investigating the money-laundering case it had registered last month, following the Central Bureau of Investigation’s (CBI’s) first information report against the Kochhar family, Videocon Industries, Dhoot and others for sanctioning certain loans to private firms in a criminal conspiracy and cheating ICICI Bank to the tune of Rs 1,730 crore. The CBI had said ICICI Bank sanctioned credit facilities of Rs 3,250 crore to several firms belonging to Videocon, such as Trend Electronics and Century Appliances, in violation of the Banking Regulation Act, RBI rules and the bank’s credit policy. ED sleuths are probing the proceeds of crime which are suspected to have been used for creating assets including properties owned by the Kochhar family. The team may cross-question the email trails and digital documents they had collected during the search operation. The ED is looking into multiple transactions including an investment of Rs 64 crore in Deepak Kochhar’s NuPower Renewables through his firm Supreme Energy. They are also looking into the alleged kickbacks Kochhar received for sanctioning loan to other corporates. The CBI probe also revealed a money trail. The loan was disbursed to Videocon International Electronics on September 7, 2009, and the next day Dhoot transferred Rs 64 crore to Kochhar’s firm Nupower through SEPL. This was the first capital received by Nupower to acquire its first power plant. This transaction showed Chanda Kochhar got “illegal gratification/undue benefits” through her husband’s firm, the agency had alleged.